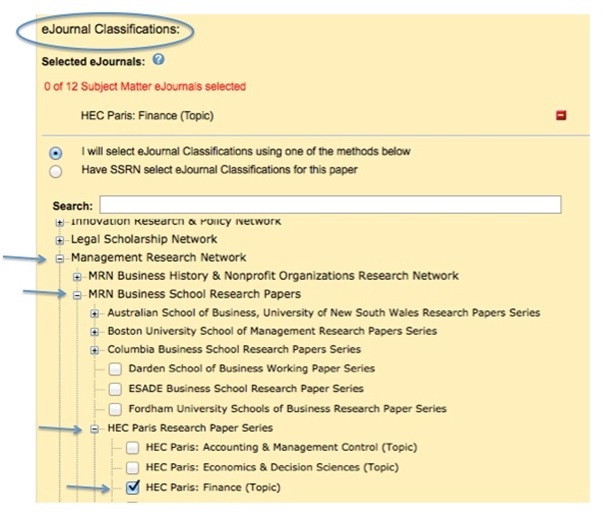 During the deposit process on SSRN and in addition to selecting the collection HEC Paris Research Paper Series, you can select one or more (up to 12) other e-Journals to increase your visibility. This approach puts your work in front of as many thematic pages on SSRN as possible, and sometimes on newsletters sent to subscribers (as is the case for the HEC Paris e-Journal collection). 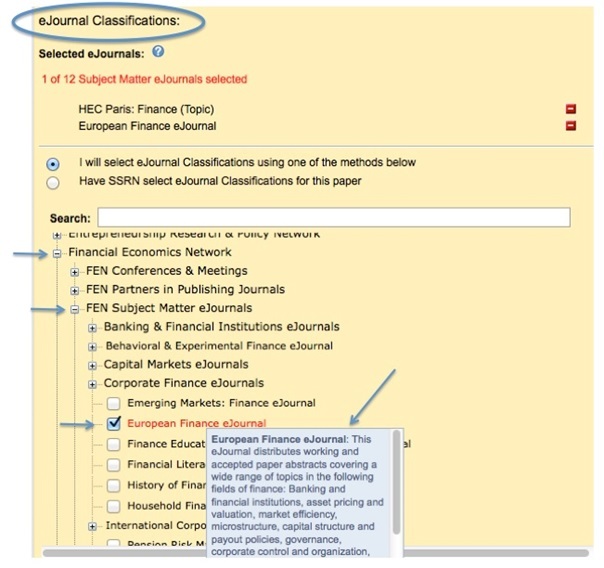 Simply select the topics that interest you from the list provided under the e-Journal Classification field of the registration form. SSRN offers additional information for each e-Journal, that you can view by mousing over the selection. To be ‘visible’ on the HEC Paris page of on SSRN is to gain visibility on SSRN, and also on search engines such as Google and Google Scholar. To do this, you need to select the collection on your deposit form when you submit a paper to SSRN. – In the SEARCH box, type ‘HEC Paris’ and select your department. – Below, in the SEARCH field, tick ‘Management Research Network’ and then ‘MRN Business School Research Papers’ then ‘HEC’… then select your department. Which journals classified by HEC (A, B +, B or C) dealt with the subjects “Earnings Management” or “Financial Distress” the most over the last 10 years? 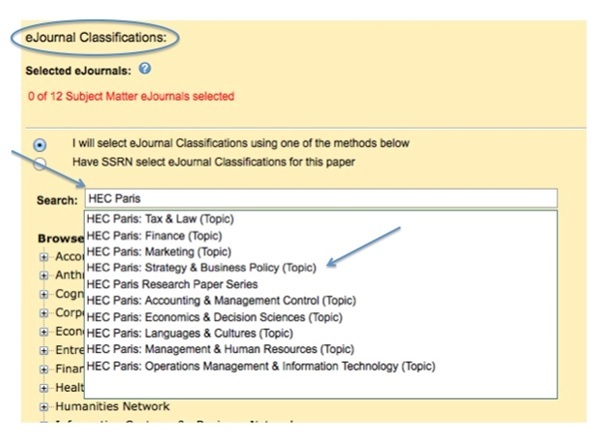 Which journals have published the most authors from HEC Paris? If you want the answers to this type of question, ask the library for the answer! We have implemented a multi source search of all journals ranked by HEC, across a wide range of research fields. The results will be presented in the form of an excel file containing the relevant algorithm results from Ebsco and will be sortable by many fields (name of journal, author, letter from HEC ranking …). Upload your research paper’s data on Mendeley.